This is probably the most relevant history book you can pick up today. Most of us, when we think of American history, think of it the way it is taught in school - a series of events that inevitably leads to certain outcomes, culminating in the America we know today. Thomas Jefferson and the Tripoli Pirates completely breaks that mid-set. From the first chapter we get the sense of how uncertain America's future was. America had just won independence from Britain, but we had, literally, no navy. Washington was determined to to be neutral in international politics, and with the country still recovering, and deeply in debt, from the Revolutionary war, he wanted neither a standing army nor a standing navy. Reality, however, was not very supportive of Washington's policy. Even before he became President, the so-called Barbary Pirates had taken an American merchant ship and enslaved all aboard. Barbary pirates were North-African based raiders that controlled the western Mediterranean sea. For America to engage in Mediterranean trade, they would either have to pay tribute to the Barbary states (Morocco, Algiers, Tunis, and Tripoli) or have to find a way to defend their trade ships. Most of the major powers, including Britain and France, paid tribute. America tried that, but being broke, could not afford it. This is where we find out that we are very lucky that we had Thomas Jefferson on our side, first as ambassador, then Secretary of State, and finally as President. 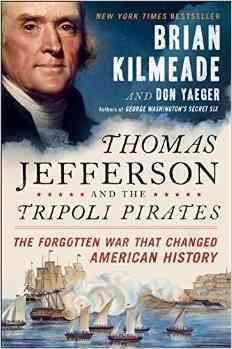 I really like how Kilmeade and Yager bring the people involved to life. There's a kindly experienced Captain, a dashing but brash young Lieutenant, a renegade American Muslim pirate. There are callous and arrogant bashaws and deys. There is Jefferson himself, a single parent to two young daughters. It's exciting stuff. I hope there is a screen adaptation. It's not just entertaining, though, it is also quite obviously a historical parallel to events we face today. Islamic attacks on America are not a new thing. Whoever our next President is, he should take a page or two from Thomas Jefferson's life. Final rating: one of the best books I've read this year.